A Chinese demand for the extradition of 11 Uyghurs from Malaysia puts the spotlight on China’s roll-out of one of the world’s most intrusive surveillance systems, military moves to prevent Uyghur foreign fighters from returning to Xinjiang, and initial steps to export its security approach to countries like Pakistan. The 11 were among 25 Uyghurs who escaped from a Thai detention centre in November through a hole in the wall, using blankets to climb to the ground. The extradition request follows similar deportations of Uyghurs from Thailand and Egypt often with no due process and no immediate evidence that they were militants. The escapees were among more than 200 Uighurs detained in Thailand in 2014. The Uyghurs claimed they were Turkish nationals and demanded that they be returned to Turkey. Thailand, despite international condemnation, forcibly extradited to China some 100 of the group in July 2015. Tens of Uyghurs, who were unable to flee to Turkey in time, were detained in Egypt in July and are believed to have also been returned to China. Many of the Uyghurs were students at Al Azhar, one of the foremost institutions of Islamic learning. China, increasingly concerned that Uyghurs fighters in Syria and Iraq will seek to return to Xinjiang or establish bases across the border in Afghanistan and Tajikistan in the wake of the territorial demise of the Islamic State, has brutally cracked down on the ethnic minority in its strategic north-western province, extended its long arm to the Uyghur Diaspora, and is mulling the establishment of its first land rather than naval foreign military base. The crackdown appears, at least for now, to put a lid on intermittent attacks in Xinjiang itself. Chinese nationals have instead been targeted in Pakistan, the $50 billion plus crown jewel in China’s Belt and Road initiative that seeks to link Eurasia to the People’s Republic through infrastructure. The attacks are believed to have been carried out by either Baloch nationalists or militants of the East Turkestan Independence Movement (ETIM), a Uighur separatist group that has aligned itself with the Islamic State. 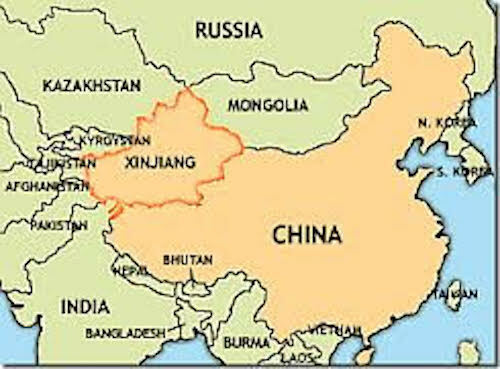 Various other groups, including the Pakistani Taliban, Al Qaeda and the Islamic State have threatened to attack Chinese nationals in response to the alleged repression of Uyghurs in Xinjiang. ETIM militants were believed to have been responsible for the bombing in August 2015 of Bangkok’s Erawan shrine that killed 20 people as retaliation for the forced repatriation of Uighurs a month earlier. China has refused to recognize ethnic aspirations of Uyghurs, a Turkic group, and approached it as a problem of Islamic militancy. Thousands of Uyghurs are believed to have joined militants in Syria, while hundreds or thousands more have sought to make their way through Southeast Asia to Turkey. To counter ethnic and religious aspirations, China has introduced what must be the world’s most intrusive surveillance system using algorithms. Streets in Xinjiang’s cities and villages are pockmarked by cameras; police stations every 500 metres dot roads in major cities; public buildings resemble fortresses; and authorities use facial recognition and body scanners at highway checkpoints. The government, in what has the makings of a re-education program, has opened boarding schools “for local children to spend their entire week in a Chinese-speaking environment, and then only going home to parents on the weekends,” according to China scholar David Brophy. Adult Uyghurs, who have stuck to their Turkic language, have been ordered to study Chinese at night schools. Nightly television programs feature oath-swearing ceremonies,” in which participants pledge to root out “two-faced people,” the term used for Uyghur Communist Party members who are believed to be not fully devoted to Chinese policy. The measures in Xinjiang go beyond an Orwellian citizen scoring system that is being introduced that scores a person’s political trustworthiness. The system would determine what benefits a citizen is entitled to, including access to credit, high speed internet service and fast-tracked visas for travel based on data garnered from social media and online shopping data as well as scanning of irises and content on mobile phones at random police checks. Elements of the system are poised for export. A long-term Chinese plan for China’s investment in Pakistan, dubbed the China Pakistan Economic Corridor (CPEC), envisioned creating a system of monitoring and surveillance in Pakistani cities to ensure law and order. The measures were designed to address the risks to CPEC that the plan identified as “Pakistani politics, such as competing parties, religion, tribes, terrorists, and Western intervention” as well as security. “The security situation is the worst in recent years,” the plan said. At the same time, China, despite official denials, is building, according to Afghan security officials, a military base for the Afghan military that would give the People’s Republic a presence in Badakhshan, the remote panhandle of Afghanistan that borders China and Tajikistan. Chinese military personnel have reportedly been in the mountainous Wakhan Corridor, a narrow strip of territory in north-eastern Afghanistan that extends to China and separates Tajikistan from Pakistan since March last year. The importance China attributes to protecting itself against Uyghur militancy and extending its protective shield beyond its borders was reflected in the recent appointment as its ambassador to Afghanistan, Liu Jinsong, who was raised in Xinjiang and served as a director of the Belt and Road initiative’s $15 billion Silk Road Fund.